A council has objected to plans for a wind farm off the coast of north Wales after hearing it could damage tourism. A study by Conwy Council officers said not enough had been done to assess the risks of siting 200 turbines 15km off Llandudno by NPower Renewables. The council, meeting on Thursday, asked for a public inquiry by the Department of Trade and Industry into the scheme. The developers said off shore wind farms elsewhere had done little to damage tourism. The wind farm - called Gwynt Y Mor - would involve wind turbines, offshore sub-stations, inter-turbine cables and an onshore sub-station. 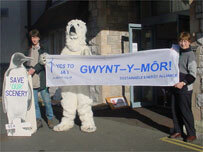 Conwy Council heard representations from both sides of the argument. A packed public gallery heard two 20 minute presentations, one by Save Our Scenery (SOS), who are opposed to the development, followed by NPower Renewables. The Llandudno project will not be decided on by the local planning authority - the Department of Trade and Industry (DTI) is set to judge whether it should go ahead. Councillor Gareth Jones expressed his "dismay" at the meeting that the decision would be taken outside Wales. SOS claim that as well as being detrimental to tourism, the wind farm would have an effect on noise levels, ecology and coastal defences. John Lawson-Reay from SOS, said: "This is why people come to north Wales, they come here for the view. "Here we are talking about an area of 50 square miles, stretching 17 miles along the coast from Llandudno to Prestatyn. This is a wall of steel. "The area covered will be so great it will have a dramatic impact." A photomontage of the view of the windfarm developments from Llandudno. Llandudno resident Peter Green said outside the meeting it was "preposterous" to even consider such a large wind farm in the town. "It would be a visual obscenity," he added. A report from council officials expressed concern that the development has potential to harm Llandudno's tourist industry. But NPower Renewables' development manager, Alastair Gill, said existing wind farms had not had the effect of damaging tourism. The company has already developed a smaller off-shore wind farm off Rhyl and Prestatyn. Mr Gill added: "The only evidence we have to go on is the existing wind farms that are out there which don't appear to have damaged the tourist industry. "The surveys we have carried out find that most people don't find wind turbines quite some way out to shore a problem that would prevent them from coming back." Supporters of the scheme lobbied councillors as they made their way into the meeting. Jonathan Lincoln, co-ordinator of the environmental campaign group Sustainable Energy Alliance (Sea) said: "We simply have to change the way we produce energy, and prioritise investment in renewable energy such as the Gwynt-y-Mor wind farm." Friends of the Earth (FoE) accused objectors of being too "emotive" in their presentation. "They are not being realistic. I have spoken to people on the street and 90% of them are not bothered either way about a development like this," said FoE member Roberta Owen. "A lot of people like to come and see them, and they can be a tourist attraction in their own right," she added.